Super easy and quick: this was on the table in under 15 minutes and tasted great! It’s also another healthy recipe for all of you January dieters (us included!). This serves two people. Make a cut in the side of each chicken and open them up like a book. Cover in cling film and flatten out evenly with your hands. Mix garlic and thyme with 2 teaspoons of olive oil and spread over the chicken. Heat a non-stick frying pan and cook the chicken for 2 minutes on the first side and 1 minute on the other. We needed to do them separately as our frying pan wasn’t big enough for two (and the pan is big). Put both chicken breasts back in the pan when done, pour over the lemon juice and season well. Make sure you turn them over to pick up the pan juices and tasty bits. 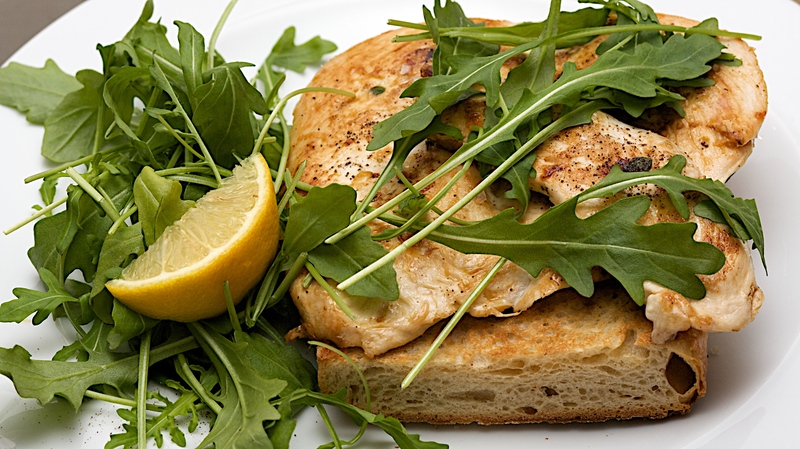 Serve each chicken breast on a slice of toast and top with the rocket and a wedge of lemon. I love this, easy, fast & delicious with my favourite ingredients. Yum.